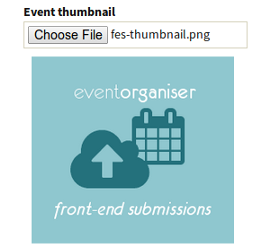 Event Organiser Frontend Submissions (FES) allows you to quickly and easily create forms by which your visitors can submit events to your site. Decide what appears on the form, where and which parts must be filled in. There are variety of field types available beyond the “event fields” (date, schedule, venue etc). These include textareas, checkboxes, radioboxes, as well as other fields for website urls, e-mail addresses and anti-spam questions. ### Supports recurring events Want users to be able to submit a recurring event? 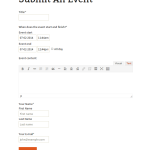 Simply add the “Event Schedule” form element to your form. Users can then create daily, weekly, monthly or yearly event. Or just a single event. 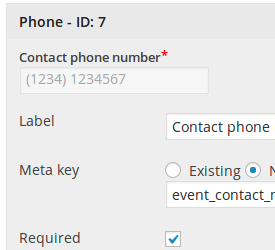 Need users to set some custom fields (post meta) with submitted events? No problem, all custom fields allow you to assign a custom field where the provided data is stored. This great for integrating the FES with other plug-ins such as Advanced Custom Fields. 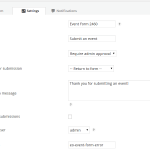 ### Decide how event submissions are handled You can choose whether events should be automatically published, or should await admin approval before it goes live. 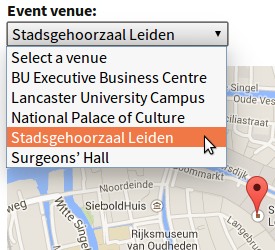 The form settings allow you to designate the desired ‘status’ of a submitted event. 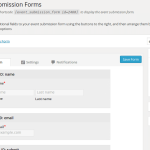 You can add form fields to allow users to assign their event to available event categories and assign the event a venue, or submit new venues/categories. Allow users to upload a image for the event. You can optionally specify a file-size limit and file-type restrictions. Event schedule (for recurring events). 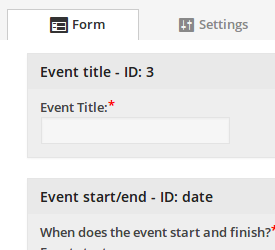 There are other ‘generic’ elements which you can add, and assign to an event’s custom field (post meta). 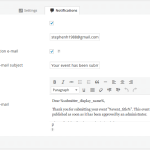 Then there are ‘advanced’ elements which include anti-spam questions, terms and conditions and ‘hook’ for triggering a WordPress action. Yes, you can create and manage as many forms as you require. Each will have their own settings which you can configure in the form customiser the form’s settings tab. Can users create venues or categories? Yes, this is disabled by default, but the venue and category fields both have an option to allow new submissions. For new venues, this will not appear on the front-end until the submitted event is first published (unless you’re an admin). Additionally, until that time, the venue will be marked as ‘pending’ in the WordPress admin area. Can logged-out users submit events? If you wish to allow them to, yes. You can set this on the form’s settings tab. Otherwise, they’ll be prompted to log-in. Can users edit submitted events? Yes, there are two ways this can be done. 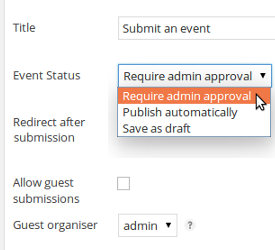 You can allow those users to edit events via the WordPress admin by assigning them an appropriate role which has permission to edit events (see Settings > Event Organiser > Permissions). For more details please see this post. Can user submit recurring events? Yes. 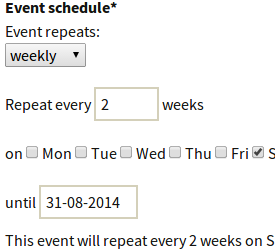 If you wish to allow users to submit recurring events you’ll need to add the “event schedule” element to the form.